In the deep shade of canopies that flutter like leafy parasols above South Temple’s historic mansions, the Alice Gallery, home to the State of Utah Fine Art Collection, displays Downy Doxey-Marshall’s newest show /klōTH/. If you’ve ever wondered how to describe the upside-down letters and slashes that follow dictionary entries, (the markings that look like ancient runes and whisper correct pronunciations to a learned few), here’s your tidbit of knowledge for the day: they’re known as “phonemes.” Doxey-Marshall’s latest show title comes from the Oxford American College Dictionary phonemes for clothe, defined as “to put clothes on (oneself or someone); to dress.” Doxey-Marshall’s smaller works in the show depict, with precise attention to texture and color relationships, technologies that allow us to cover and uncover, including buttons, straps, ties, and zippers. 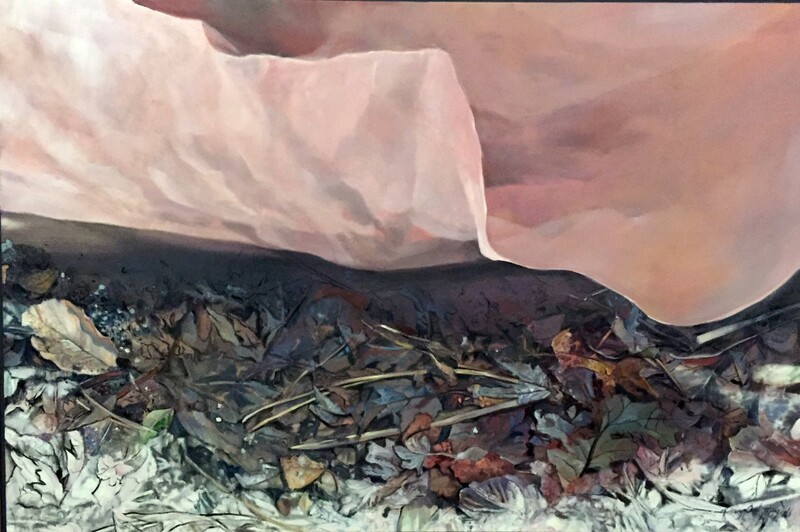 The larger pieces in the show, meanwhile, retain the interest in texture and textiles, but tip toward the surreal and allegorical with painted swaths of ethereal cloth that reflect sky and lap at the edges of rough, well-trodden underbrush. Although the arrangement of small and large pieces in /klōTH/ is balanced along the gallery walls, with alternating groups of differently sized paintings, thematically it’s useful to group the show in two: the smaller works bridge /klōTH/ to Doxey-Marshall’s earlier works, and the large paintings travel to newer, related thematic territory. After earning a BFA from the University of Utah in 1988, and an MFA from Brigham Young University in 1996, Doxey-Marshall became known for egg-tempera paintings that featured anthropomorphized everyday objects, especially furnishings. In some works, she used thread and other textile media within the paintings themselves, retaining interest in things often associated with the interior. The small paintings in her show, including “Ankle Tied,” “Unbuckled,” “Abalone Button,” and “Slips Ons” echo her past depictions of the domestic, personal, and historically-feminine realm. However, her focus in /klōTH/ on the action of putting on and taking off, the verbal aspect of the show’s title “to clothe,” relates to themes found in the larger paintings. In these, the borders between star- or sea-speckled, flowing fabric and branch-strewn, earthy ground is delineated by the rising edges of the cloth. The rippling fabrics of “Between,” “Clothe,” or “Awake,” which consume all but a small portion of the imposing canvases, look as if they are in the action of either veiling or revealing what is beneath. Doxey-Marshall’s subtle shifts in tone and color melt the light of the setting into the overlapping, flowing fabric, especially in “Burning Blue.” Here, the red-flowered pattern on the fabric defines its material more explicitly, but its reflection of a fiery forest and starry sky above betray the fabric as something beyond earthly silk or satin. The ambiguous relationship between patches of ground covered in debris and the fabrics speak to the connections between weaving cloth and myths of creation that occur in numerous cultures. Many cultural traditions connect the act of making thread and cloth to the generation of time or the fabric of the universe. In Greek mythology, for example, one of the Moirai sisters, the goddesses of fate and destiny, Clotho, spins the thread of life for every mortal, while her sister Lakhesis measures its length, and Atropos finally cuts it. Although our clothing is intensely personal and helps make up individual identities, in her larger works, Doxey-Marshall takes what we often consider to be part of the “everyday” or domestic, and reminds viewers of a richer, charged symbolism. This connects the themes present in Doxey-Marshall’s early works and brings them into the universal, mythic realm. This article appeared in the June 2016 edition of 15 Bytes.